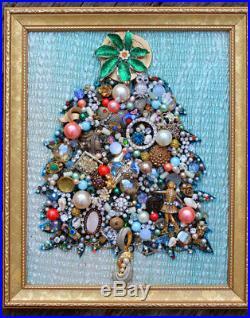 Absolutely stunning Vintage Jewelry Christmas Holiday Tree. Rhinestones, Pearls, Crystals, Bits and Bobs of gold and silver. Jewelry handcrafted into this gorgeous work of art handmade by. Each tree is one a kind and made with love. What an AMAZING ONE OF A KIND GIFT!! Many going up this week - check back! And expect the same from all of our customers. All items are photographed and described as clearly as possible to the best of our knowledge and research. If you feel you know more about an item than we do. Kindly send a pleasant message and share your wisdom! We do not dry clean clothing, repair or polish items (unless otherwise noted). We do clean up our items for presentation. Once in our possession, ALL items are stored in a SMOKE/PET FREE ENVIRONMENT. Original storage situation of our items. To explain any problems that may arise upon receipt of your items. We are always willing to work things out so that our customers are happy and return again and again! Please check out our other items from Past Onward Vintage you might find something else you like! We will gift wrap it perfectly at no extra charge. Thank YOU and have a fantastic day!! The item "Vintage Jewelry Lot Christmas Tree Framed Wall Art Heirloom Gift Rhinestone Gold" is in sale since Wednesday, April 4, 2018. This item is in the category "Jewelry & Watches\Vintage & Antique Jewelry\Costume\Retro, Vintage 1930s-1980s\Collections, Lots". The seller is "pastonwardvintage" and is located in Eliot, Maine. This item can be shipped to United States, Canada, United Kingdom, Denmark, Romania, Slovakia, Bulgaria, Czech republic, Finland, Hungary, Latvia, Lithuania, Malta, Estonia, Australia, Greece, Portugal, Cyprus, Slovenia, Japan, Sweden, Taiwan, Thailand, Belgium, France, Hong Kong, Ireland, Netherlands, Poland, Spain, Italy, Germany, Austria, New Zealand, Philippines, Singapore, Norway, Saudi arabia, Ukraine, United arab emirates, Qatar, Kuwait, Bahrain, Croatia, Malaysia, Brazil, Chile, Colombia, Costa rica, Panama, Trinidad and tobago, Guatemala, El salvador, Honduras, Jamaica, Bahamas, Viet nam, Uruguay.